Eat Banana Pudding…and lose weight. Teresa is married with two boys. She works and goes to school. She is a busy lady. She also is overweight, over tired, and under nourished. Skip breakfast, get a coffee mocha at Starbuck’s. Skip lunch, and head back to Starbucks’s drive thru and get a coffee mocha. Around 4pm need a pick up… yep, back to Starbuck’s and get a coffee mocha. By the time she makes it home and all the coffee is wore off… stand back – she may take your arm off – she is that hungry! She is exhausted, but can’t sleep at night. In four days she lost 9.1 Pounds! She is sleeping better and has energy. Teresa is learning new habits of good health and it shows. I’m proud of you and the new choices you are making to improve your health. 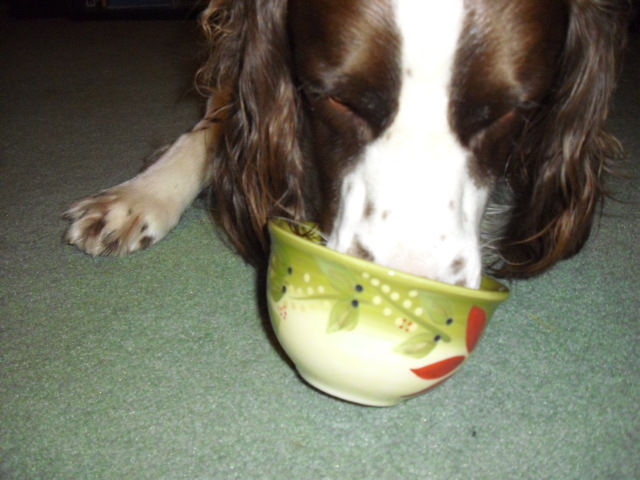 Tonight I enjoyed a Banana Pudding and so did my Springer! Who would of thought it could be this fun and easy?